Works to straighten your hair in minutes. Auto keep constant temperature at 365℉ for all types of hair, customized set 410℉ for natural texture hair, 450℉ for thick or wavy hair, effortless and efficient straightening styling. Reduce frizz & anion hydrating care. With its anti-static technology, it eliminates negative charged particles during styling. Auto shut-off protection. Please check if you turn on the red power button on the safety plug, and the power button by the side of the brush. When power is on, the temperature will be displayed on the LCD screen. To change temperature to Fahrenheit, just press the + and - keys at the same time. 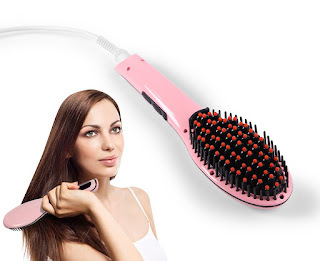 Ceramic Iron Straightener + Detangling Brush + Anion Hair Massager, ANTI SCALD design, worry free from burning your fingers and hands. Our Premier design is simple to use for Men and Women. First take time to thoroughly wash and dry hair, ensuring it is free from sweat, oils, and product. Plug brush into appropriate socket, clear from standing or running water. Press power button for three seconds until light appears. Set brush to desired temperature, brush temperatures ranges from 176 to 450℉. After 1 to 2 minutes, begin to brush hair with long continuous stroke s beginning just above the scalp and continuing in a downward motion, taking care to not place brush directly on scalp or skin. Continue brushing motions until desired straightness is achieved. If hair maintains a curly disposition, please increase brushes temperature. When finished straightening, unplug brush allowing time to cool before storing in dry area. I'm in love with this Ohuhu Brush Hair Straightener! With four kids I'm always on the lookout for anything that saves me time when it comes to styling my hair. This Ohuhu Brush Hair Straightener straightens my hair in no time and helps my hair look amazing. I love that I can also give my hair a little under curl with this brush as well. To achieve and under curl make sure you brush from underneath and curl your wrist a bit. Works like a charm! This Ohuhu Brush Hair Straightener heats quickly and allows me to detangle and straighten all at once saving me so much time. This Ohuhu Brush Hair Straightener is perfect for straightening my long wavy hair and seems to be well made. I highly recommend this Ohuhu Brush Hair Straightener!